No matter what you do for a living, chances are you spend a good amount of time daydreaming of places without four walls, ancient copy machines or disgruntled customers. Last month bike messenger extraordinaire, Craig Etheridge, gave us a glimpse into the bike messenger world. So, in the spirit of earning a living making deliveries on a bike, we’ll switch from packages to people and explore the life of a pedicab driver. A pedicabber getting ready to ride. Pro: Being your own boss – You get to decide how and when to do the job. Luck can be a factor, but genuine effort, endurance and a good sales pitch will get you where you want to be. Con: Odd hours – Depending on the crowd and what events are happening in your city, the best shifts may start at 9 p.m. and end at 3 a.m. or later. Be prepared for long nights. Pro: It keeps you fit – Like any job, you have to carry your own weight (and then some). Pulling two or even three people in your pedicab is a sure-fire way to see your stamina and strength reach new heights. Just beware, the first few weeks will involve some aching legs. Con: Weather is a factor – No matter where you’re located, winter is a slow season, or even a no go. Be prepared to pedal through rain, muck, scorching summers and frigid winters. 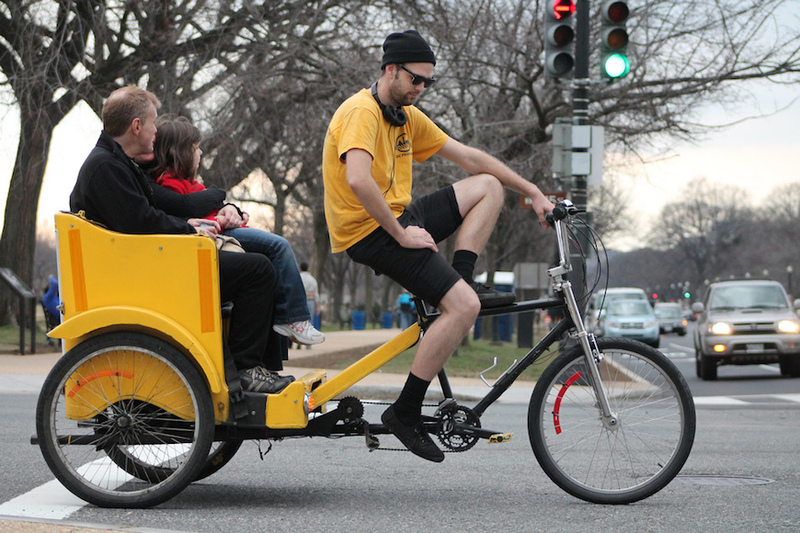 While pedicabbing can seem like a dream come true for many bike aficionados, it’s important to know the facts about how to get started, the local laws, and pedicab protocol. If you live in a bustling city with a demand for pedicabs, chances are there is more than one company to work with. Look online and ask around for reputable companies with a good track record. Once you find the right company, they can help you through the licensing process and will get you out on the street in no time. Whether it’s the drunk on the street, handsy customers (yes, it can happen), or even competing pedicab companies, take it all in stride. Most customers will be happy that you’re saving their aching feet from a walk across town, so focus on the good guys and steer clear of the jerks. Whether for best or worst, every shift is different. Both the people you meet and the money you’ll earn are never the same. Some nights you may bring home the bacon, and other nights may be dead slow and chock-full of mishaps. Learn to embrace the unknown.